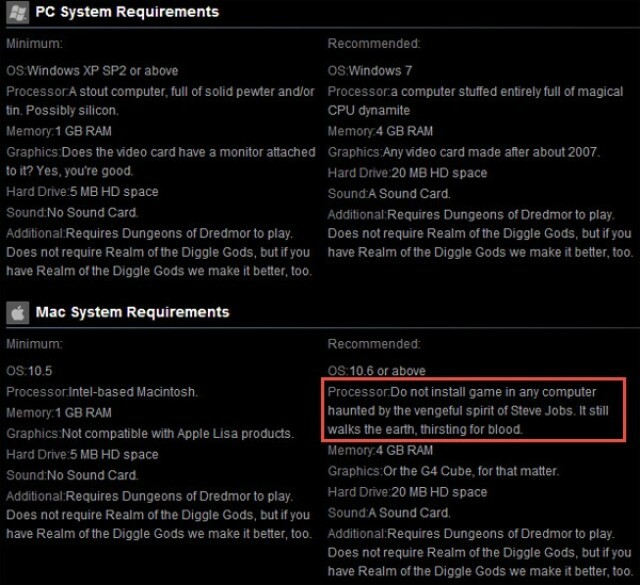 The system requirement for Dungeons of Dredmor on Steam. Dungeons of Dredmor is one of my favorite games on Steam, a funny, impish, brutal yet utterly modern entry in my favorite gaming genre, rogue-likes. It only costs $1.50 right now, which rounding down for inflation is essentially free, so you might as well buy it. It’s a great introduction to that most sadistic genre of games, the rogue-like. But Dungeons of Dredmor’s low, low price isn’t why we’re posting. Nor is the fact that it just got a free new expansion pack full of great new monsters and skills. No, the reason we’re posting is because of that expansion pack’s new system requirements, which will elicit either a chuckle or an outraged roar from Apple fans.